Choosing a cabin on a cruise ship can be a complicated task. Some ships have 20 or more categories, all with different prices, decks, and locations on the ship. When discussing cabin options, one frequent question travelers often ask of their travel agent or cruise representative is, "how do I get a free upgrade on a cabin?" It's important to remember that there's no magic, secret, or guaranteed way to get an upgraded cabin. Like with hotels and airlines, it's often luck or being at the right place at the right time. However, there are a few things you can try to improve your chances of getting an upgrade. Booking a cruise early will sometimes result in an upgrade. 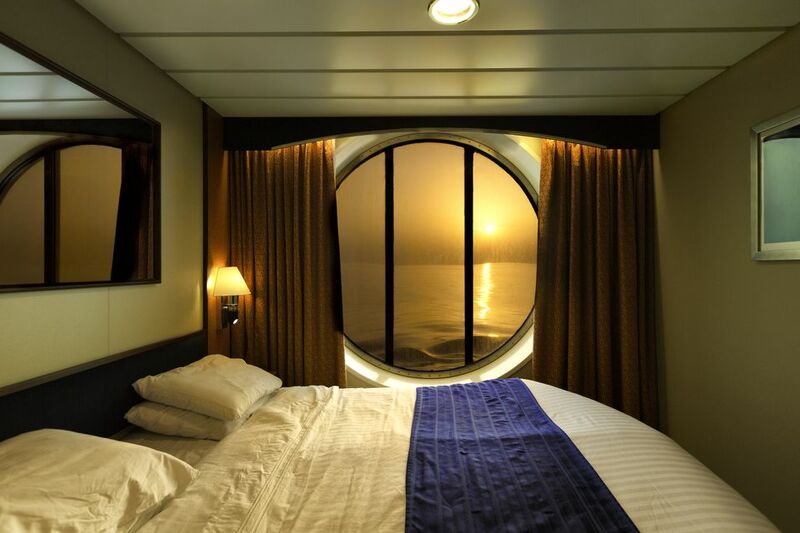 Cruise ships usually sell out the most expensive cabins and suites first, but the cheapest cabins come next. If you are one of the first to book a cheap cabin, you might get upgraded as the cruise date gets closer if demand is high for your cabin category. Like with airlines and hotels, cabin upgrades often go to members of the cruise line's frequent cruiser programs. If you are a frequent cruiser, you might also get free Internet access, free laundry, or other perks, depending on the number of days you have sailed with the cruise line. Unfortunately, sometimes being a frequent cruiser can be a disadvantage. A cruise line might not upgrade someone who already loves sailing with them. Sometimes, a cruise line will upgrade either new experienced cruisers or first-time cruisers in order to get them "hooked" on cruising with their cruise line. There are two scenarios. Let's say you have always sailed with Cruise Line A, but decided to try Cruise Line B. The new cruise line might give you an upgraded cabin in order to encourage you to sail with them again. The second scenario applies to first-time cruisers. A cruise line might upgrade someone who has never sailed on any cruise ship in order to improve their overall cruise experience. Check with your travel agent at the time of booking and again throughout the time before your cruise. Some travel agencies purchase blocks of cabins, and your agent might upgrade you if a higher level cabin is left unsold. The travel agent might also know from past experience which cruise lines, cruise ships, and cruise itineraries are more likely to upgrade. It never hurts to ask! Booking a "guarantee" cabin means you are only reserving a particular category, not a specific cabin. The "guarantee" from the cruise line is that you will get either the category you have reserved or a higher one. The disadvantage of a guarantee cabin is that you might not get either the specific area of the ship you prefer or even the specific deck. The advantage is that you will be more likely to get an upgrade than someone who has booked a specific cabin since the cruise line will not need to ask you before the upgrade. Just because you've booked your cruise does not mean you should quit checking the advertised prices as the time gets closer to your sailing date. Many cruise lines and travel agencies offer "low price guarantees" to encourage cruise travelers to book early. With a ​low price guarantee, you will get a refund or a shipboard credit if the price falls below what you paid. These extra funds could be used to upgrade if a higher level was available. For example, a family of four travelers once booked a 12-day cruise over a year in advance of sailing. When the price dropped $700 per person, they inquired of the travel agency and got a credit. That $2800 paid for all of the shore excursions and onboard expenses. What a pleasant surprise! Most cruises go smoothly and the passengers have a wonderful cruise vacation. However, sometimes stuff happens. If you have a problem with your cabin, inform the customer service staff on the ship immediately. If the problem can't be resolved quickly, you might get an upgrade or a credit on a future cruise. You are more likely to get an upgrade on a ship that is not full. If you plan your cruise vacation in the off-season or to a less popular destination, you will either get a great deal on the price and/or an upgrade to a higher cabin category. Savvy cruise travelers who love the onboard experience have long recognized the bargains in repositioning cruises because they feature more sea days and fewer ports. Since the cheapest cabins sell out the quickest, booking an inside cabin on a ship with only a few such cabins might result in an upgrade. Cruise ships like to sail full, and if demand is high for the lower grade cabins, passengers holding reservations for those cabins might get an upgrade. One caveat—don't count on this happening. Be prepared to sail in that small inside cabin. This tip is the opposite of booking early. If you book a cabin in a sold-out category, you might be the one upgraded rather than the passenger who booked early. Sometimes, it's just a matter of luck.